The Kinzie collection will help you create a fun and bright youth bedroom or playroom in your home. 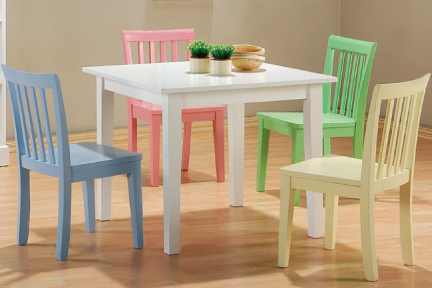 Simple style, soft colors, and great function come together in this cool children's table and chair set. For a space that both you and your child will enjoy, choose the Kinzie collection. White table with soft blue, pink, green, and yellow side chairs. FL Comment: Assembly required, CUTE!